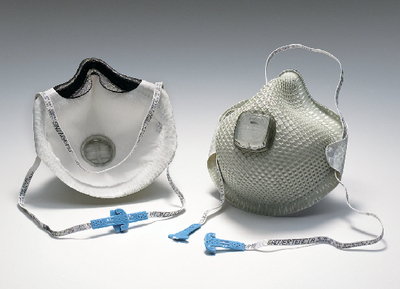 Disposable respirator provides a filter efficiency level of 95% or greater against particulate aerosols free of oil up to 10 times OSHA Permissible Exposure Limit (PEL). Stretchable HandyStrap® with buckle allows mask to hang around neck when not in use. Exclusive Ventex® valve vents hot air out for reduced breathing resistance. Soft foam nose flange eliminates pressure points. Dura-Mesh® shell resists collapsing in heat and humidity and keeps filter media clean-looking longer. Soft lining increases worker comfort. Available in two sizes.